If you are a PeopleSoft consultant, solutions or service provider and looking for reliable marketing data to achieve better results on your offline and online promotional campaigns, Blue Mail Media can be a significant enabler. 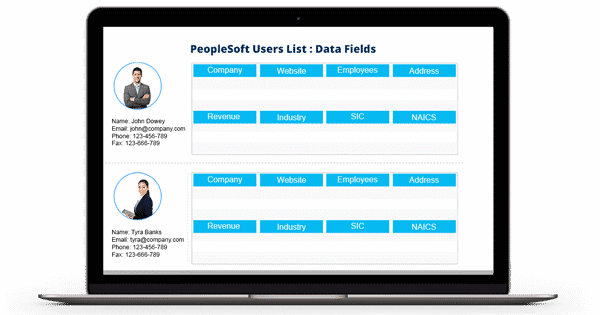 Our PeopleSoft Users Email Database has been designed to help you meet your multi-channel marketing data needs and gain the required traction in your marketing efforts. Whether you wish to connect with your target audience via telephone, email or mail, our list will give you access to all the required data to meet the purpose. Blue Mail Media has a well established presence across major technology markets such as the US, UK, North America, Europe, Australia, New Zealand, Africa, Middle East and South America. This enables us to serve clients without any regional barriers. Blue Mail Media offers pre-packaged as well as customized PeopleSoft customers list and the list of companies using PeopleSoft across different countries in the world. As a PeopleSoft solutions provider, implementation partner or service provider, our list can unlock significant benefits for you in terms of your campaign response rate, conversion rate and return on investment.